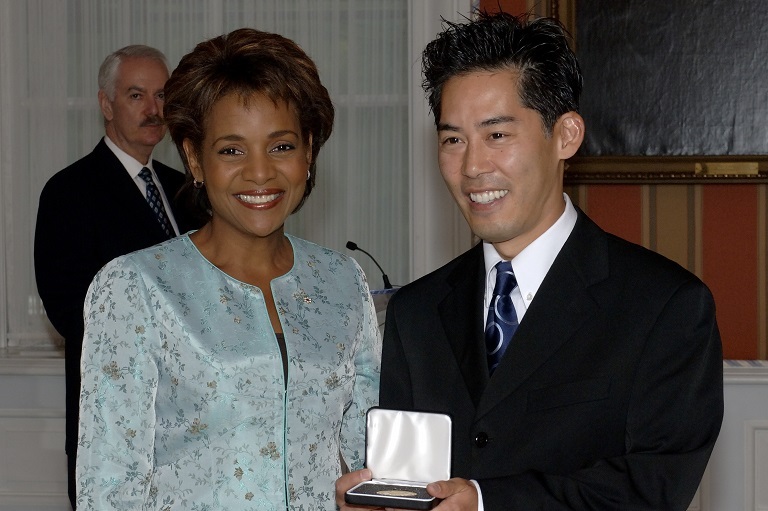 Greg Miyanaga accepting his award at Rideau Hall, 2006. This submission is a unit co-created with Patricia Tanaka and Masako Fukawa that teaches grade 4 and 5 students about the history of Japanese-Canadians during WWII. This is a collection of “hands-on, minds-on, and hearts-on” lessons about Japanese internment and redress. The issues that come out of the lessons and discussions involve such topics as racism, bullying, human rights, justice, and atonement. The students will learn about how Canada addressed this issue with the adoption of the Charter of Rights and Freedoms, and the formal apology to Japanese Canadians in 1988. The lessons are designed to develop critical thinking skills by personally engaging students while they learn about the complex content. Activities include interactive games, photo analysis, models of internment quarters, reflective journal entries, and role-playing how to apologize after making a mistake.